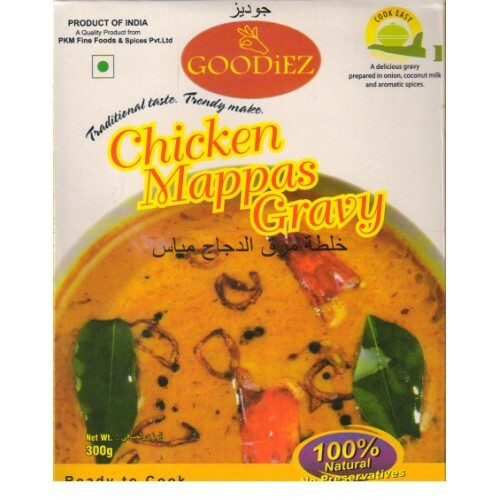 Take 500gm cleaned chicken pieces, 200ml water and Kurians Mappas Gravy in a pressure cooker. Mix well. Cook to 3 whistles. Boil necessary. Serve hot. Take 300g cleaned ladies finger pieces and fry it in a little oil. Add Kurians Mappas Gravy and 500ml water into it. Cook to 10 minutes or till the vegetable is cooked and the gravy is thick. FREE FROM ARTIFICIAL COLOURS, FLAVOURING AND PRESERVATIES. Ingredients: Coconut, Tomato, Onion, Sunflower oil, shallots, Coriander, Garlic, Green Chilly, Ginger, Salt, Curry Leaves, Chilly, Turmeric.